I was driving Max home from swimming class, mentally preparing myself for what I was about to see at my house. My stomach was in knots, my mind was racing, I was anxious. I was thinking about that bottle of Ativan I have packed away somewhere, and how I wished I knew where it was. 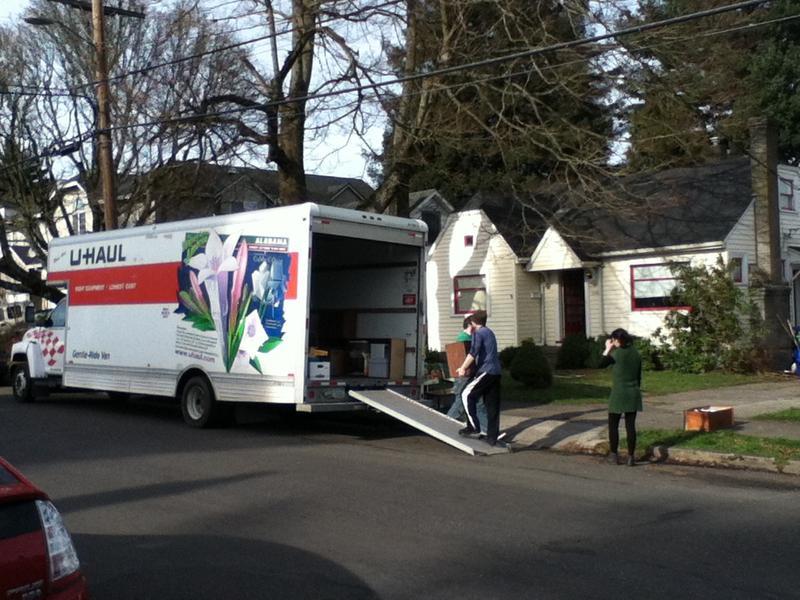 I turned onto our street, SE Francis st, and very quickly I could see it; the 26 foot long UHaul. My heart hit the floor. My stomach jumped into my throat. My eyes welled up. As I got closer I could see just about everything we owned packed tightly in there with care by our good friends. I took a deep breath and told myself ‘This is it. It’s happening, and there’s no turning back’. It wasn’t long after I had gotten there that the UHaul was all packed up, and our hard working friends were in their cars ready to go. I stayed behind with Max to wait for my mom to come sit with him until everything was moved in. 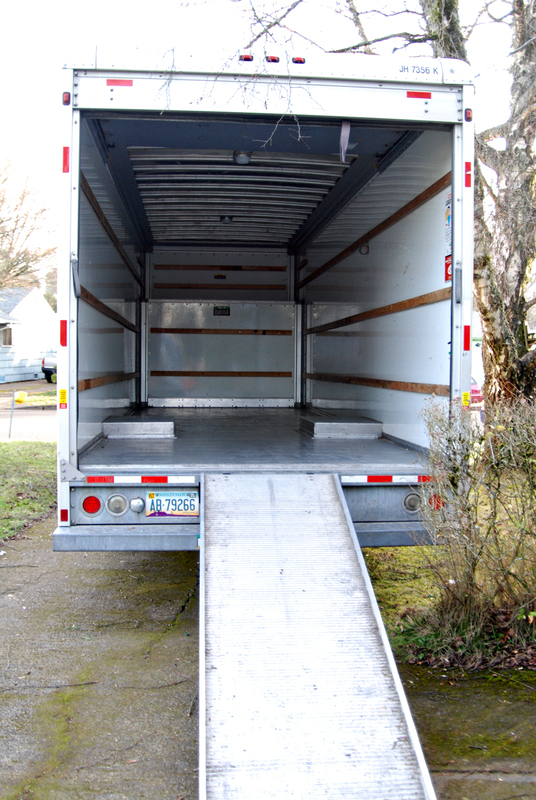 I stood on the front porch holding my baby while Rob in the 26 foot long UHaul led the caravan to our new home. When I went back inside I didn’t know what to do. The rooms were empty. After leaving Max with my mom, and picking up pizzas for everyone it was time to actually move in. Again, it went quickly. And it only went quickly because of all the amazing help we had. THANK YOU TOTALLY AWESOME SUPER FRIENDS! 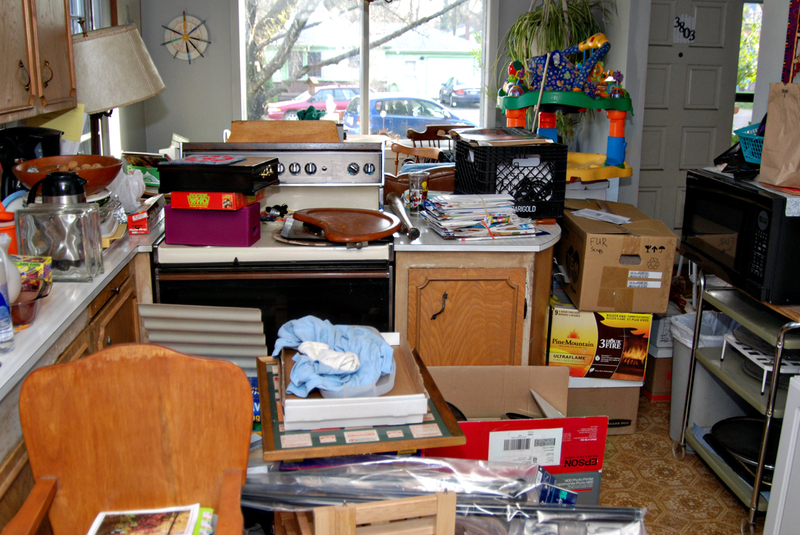 Once everything was moved in, it was nearly impossible to go anywhere. And a week later it still kind of looks like that. 1) I never want to not have the internet or cable ever again. We went for four days without both, and I felt so disconnected! I had no idea what was going on in the world, I couldn’t read my celebrity gossip, I couldn’t hate-read some of my least favorite blogs, and worst of all I didn’t get my daily dose of Roseanne or fall asleep at night watching Friends. But now, they’re both back and I feel complete. 2) I really expected to be more emotional about this, and maybe when we’re fully done with the old house (Finally sell it, burn it to the ground, whatever), I might be. Or maybe I won’t. The night before the move Shauna came over with wine and we reminisced about all the amazing, life changing events that took place in this house. It was so fitting that she came over because Shauna lived with us for two years (was it two years? I really don’t remember). She told me that while we’ve made a lot of memories here, we’ll create even more at our new house. And that we’d die there. My first reaction was Um, what? But then I thought about it and realized that this new place was going to be our forever home. We’re going to raise our kids there, and grow old there. And maybe we will die there, or in whatever retirement home our kids throw us in. Right now, I feel really good about things, about our new life in our new home. We’ve spent most of the last week at Future Home painting, painting, touching up, pulling up carpet and painting some more. Last Saturday was the beginning of it all. We had the help of a couple of my best girls, Katie and Joy, and got the ceiling and trim done. Painting the ceiling was 1) soooo much easier than I thought it would be and 2) so incredibly satisfying. Watching the yellowed and dinged color disappear under the crisp, clean white was…it just made me so glad I decided to paint it at all. Sunday was all about walls. The white walls in the living room and the blue walls in Max’s room. Again, seeing the fresh white paint on those walls was so satisfying. 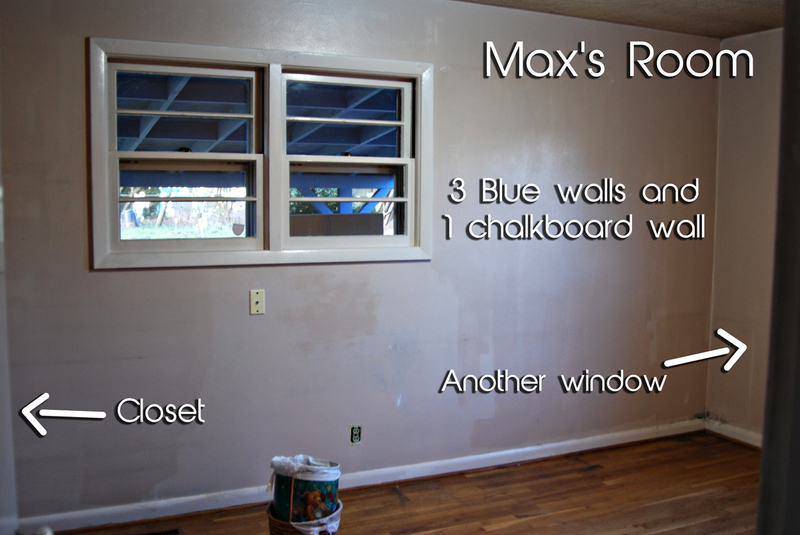 Both the living room and Max’s room took two coats, as predicted. We were able to do both rooms the same day with the four of us working. Monday was all about the accents walls. 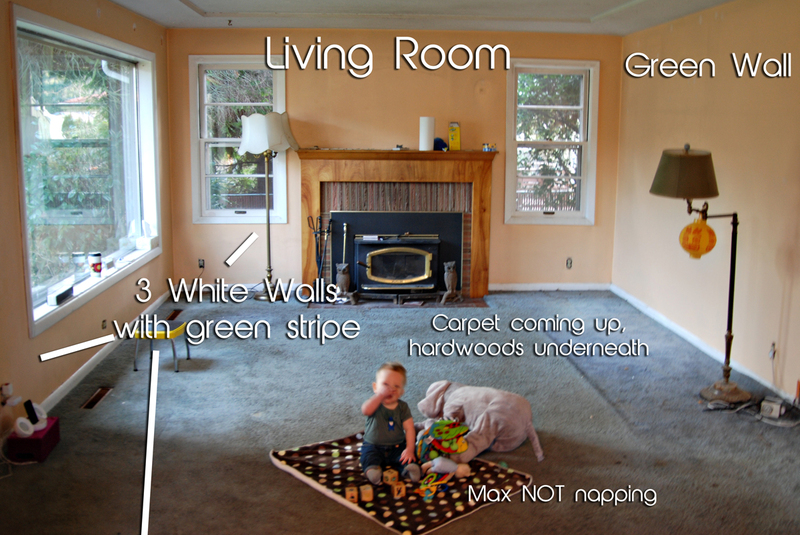 The green wall in the living room and the black chalkboard wall in Max’s room. 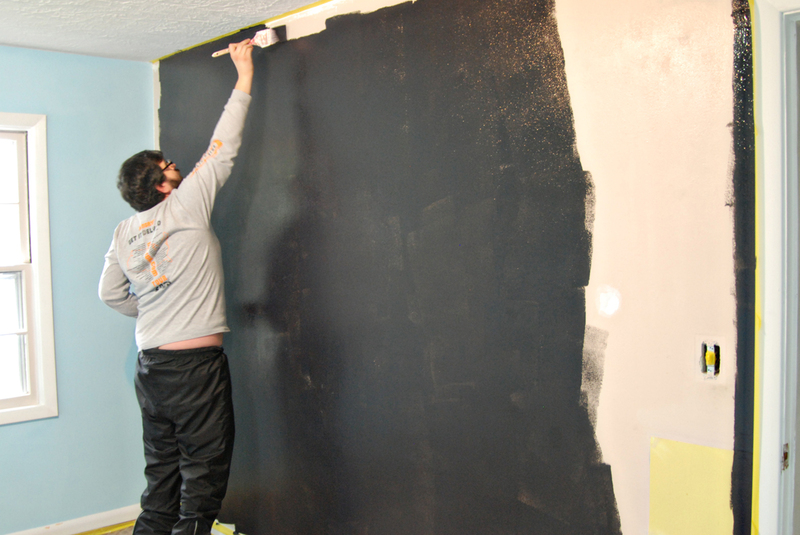 Now, let’s talk about that black chalkboard wall. I’m getting the feeling that it’s either a love it or hate it type of thing, and obviously I love it. 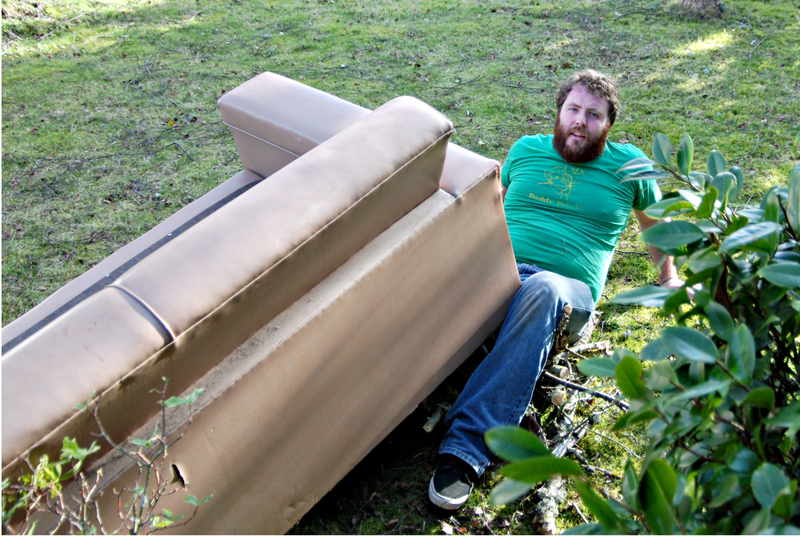 Rob’s worried about what his mom’s going to think about it. I think she’ll like it too, especially once there’s chalked graffiti all over it. Back to the walls. I was so excited to see what both of these would look like. 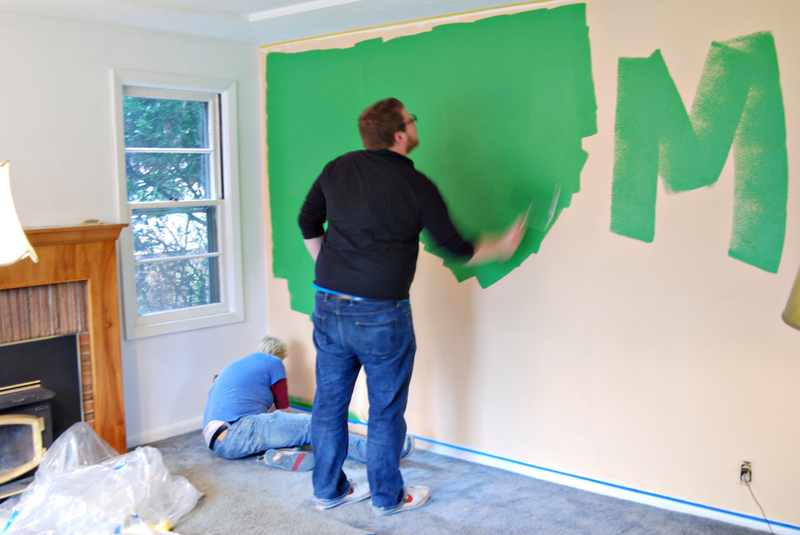 I put the first few rolls of Envy green on the living room wall, and I was immediately enamored. It. Was. Gorgeous. I wanted to hug it. Mike and Katie took over that wall while Devo and I worked on the chalkboard wall. I bought 3 quarts of chalkboard paint from Home Depot with the hope that that would be all I would need. I poured an entire quart in the tray and got to work. We were able to do one coat with that quart with some leftover. 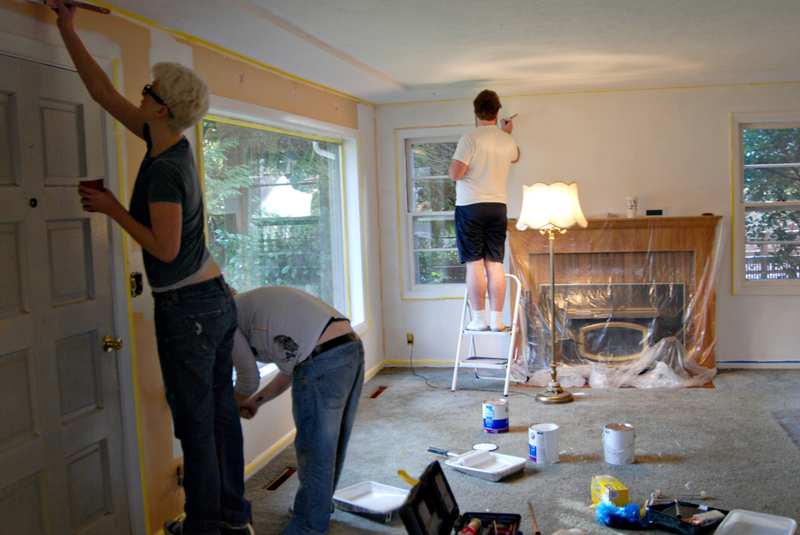 Both walls needed to dry before applying a second coat, so we finished up the following day. Once both walls were done, I just wanted to sit and stare at them. I was, and am, so happy with how both rooms turned out. 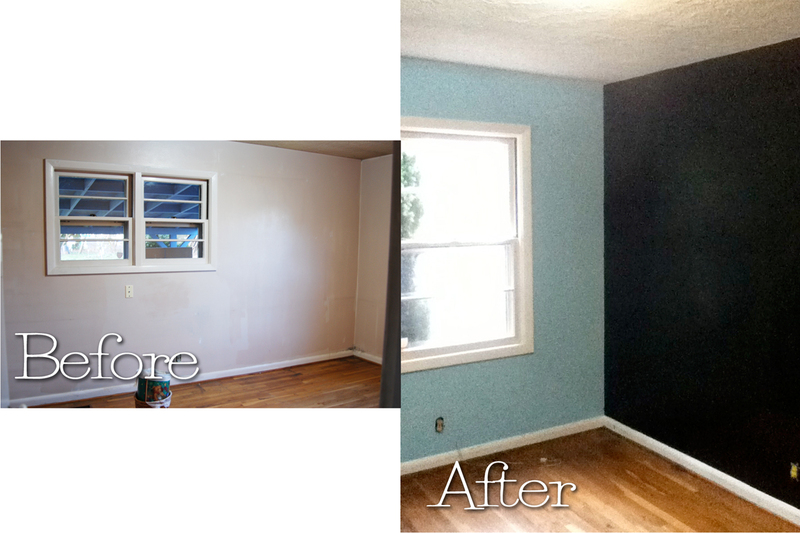 I did a bad job of taking before and after photos of Max’s room. In fact the after photo was taken with my iPod. But you get the idea. I love it. I love it and I can’t wait to draw all over it with colorful chalk! So, today after a couple of days off we returned to remove the carpet. Rob and Mike actually had the carpet out and were pulling out tack boards and nails when Shauna and I got there. 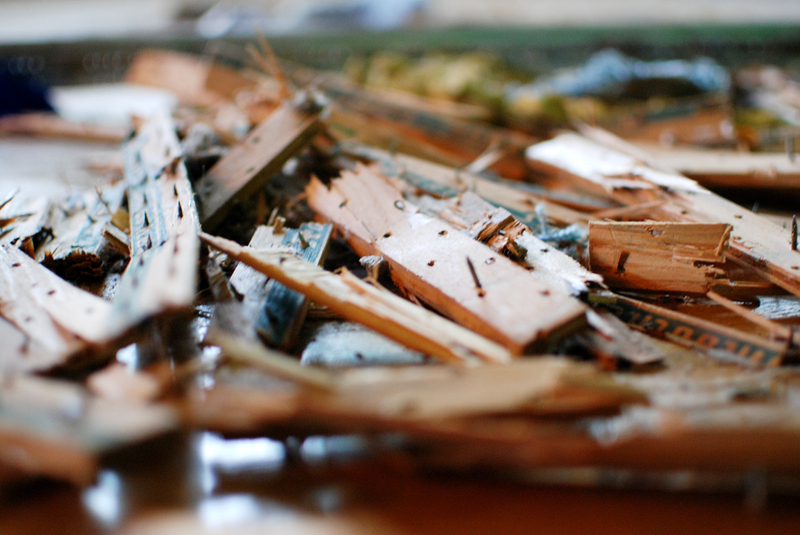 There were still tack boards and nails and staples in the floor, but it looked beautiful. Still glossy and untouched. The boys left to do take care of other things and Shauna and I got every last nail, staple and tack board out of that floor. You guys, we got really lucky here. These floors look fabulous. 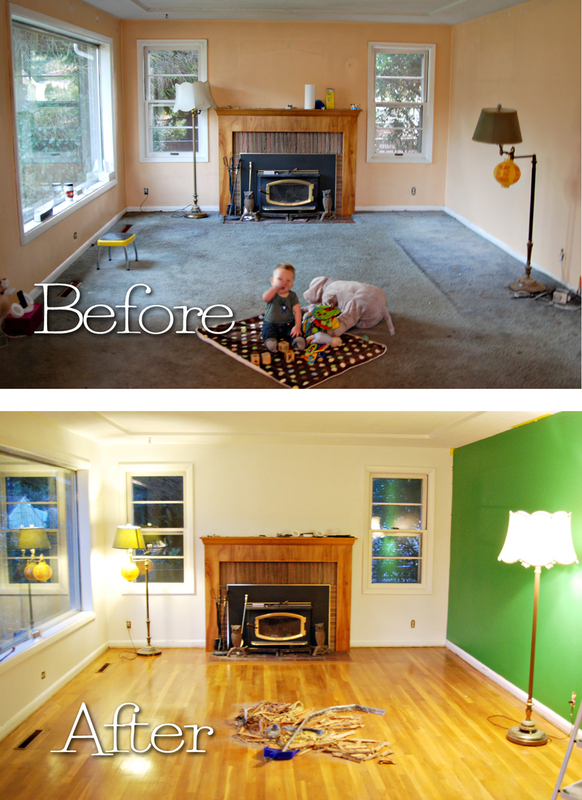 Just take a look at the before and after: Look at that shine on the floor! All I did was sweep! Now we’re going to have to have the wood floors throughout the house polished to look this good. -Finish painting the baseboards. The bottom half was under the carpet. -Touch up the green along the ceiling. A little bit came off with tape. 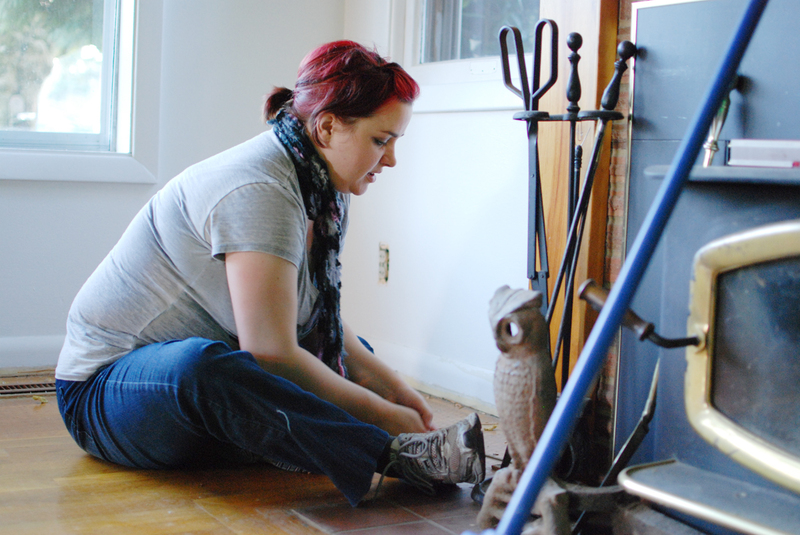 -And eventually refinish the mantel. I know a few people would choke me for wanting to do that, but I’m just not big on light colored wood. I think I’d like to re-stain it a darker color. Thoughts? Speaking of painting that stripe, I don’t think I mentioned where my inspiration for that came from. 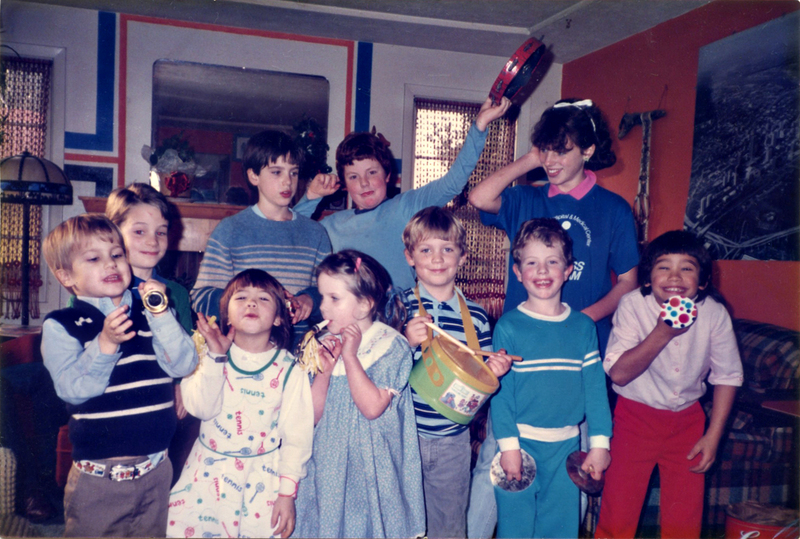 While we were over at Future Home a few weeks ago Rob was looking through an old photo album and pointed out a photo (pictured below) that showed what the living room looked like circa 1984ish? Three of the walls were white (same 3 as ours) and the accent wall was orange. There were blue and orange stripes going around the mirror on the mantel. I immediately thought we should do the same. How adorable is little Rob there? So that’s how that came to be. Hopefully we’ll have the remainder of the checklist checked off by the end of the week and we can start actually moving in. Also, it would be really swell if the weather cooperated. Does anyone have any pull with Mother Nature? If you do, will you please put in a good word for us? Thanks! Oh! One more thing. THANK YOU to our totally awesome friends who’ve helped us out (and will continue to). We truly couldn’t have done it without you guys. We’ve begun work on Future Home and OMGIAMSOEXCITED. Holy crackers I have so many things I want to do and paint and refinish and make my own. Have I mentioned how this all came about? I don’t remember so I’m going to tell you anyway. 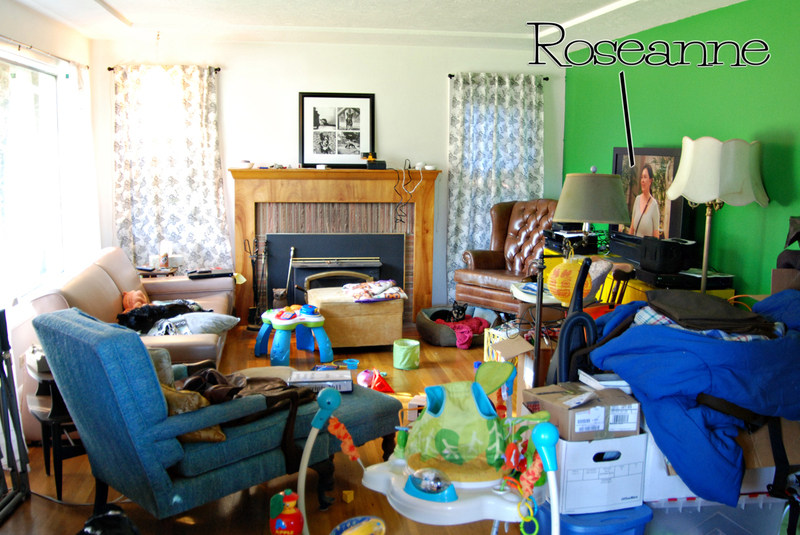 About two years ago Rob’s parents mentioned us taking over the family house at some point. They would downsize and live the downtown life along Portland’s waterfront, and we would raise the next generation of Campbell’s in the family home. At the time neither of us were ready, but then that whole me getting pregnant thing happened and we realized how nice it would be to have more space. So the idea became a plan. Rob’s parents are on a nearly 3 month long cruise (to amazing places like ANTARCTICA!) and the plan is for us to move in while they’re on their trip. Before they left we went through the house and took notes on what they wanted to keep and what they wanted to get rid of. When they get back in March they’ll be living with us until they find a place. 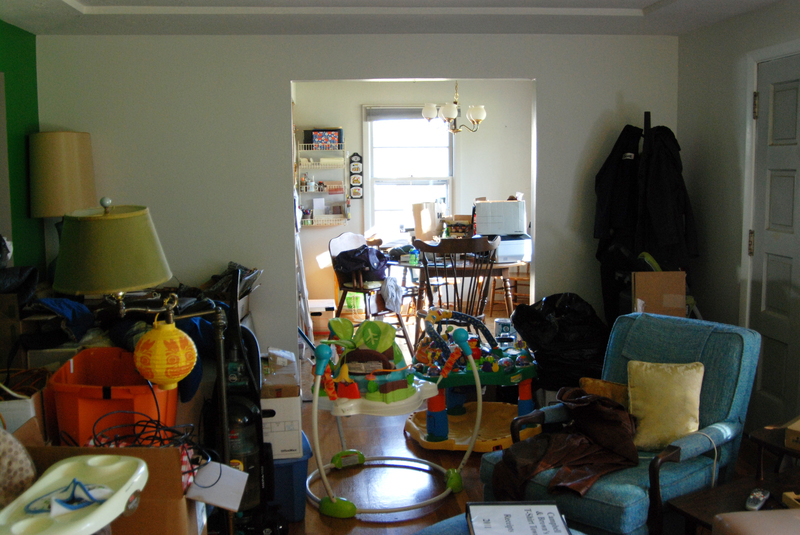 So, for the time being all their belongings are being moved to the (finished) basement to make room for our stuff. Sunday Mike and Katie came over to help clear out the living room and Max’s future room. These are the two rooms we’d like to get painted before moving in. We got them cleared out, and Wednesday Katie and I cleaned the walls, removed all the outlet and switch plate covers and filled in any holes with spackle. Now, paint. I have a love hate relationship with painting. I love watching the change happen, but man it kills my arms and it is so. damn. messy. I mean, I’m so damn messy with it. 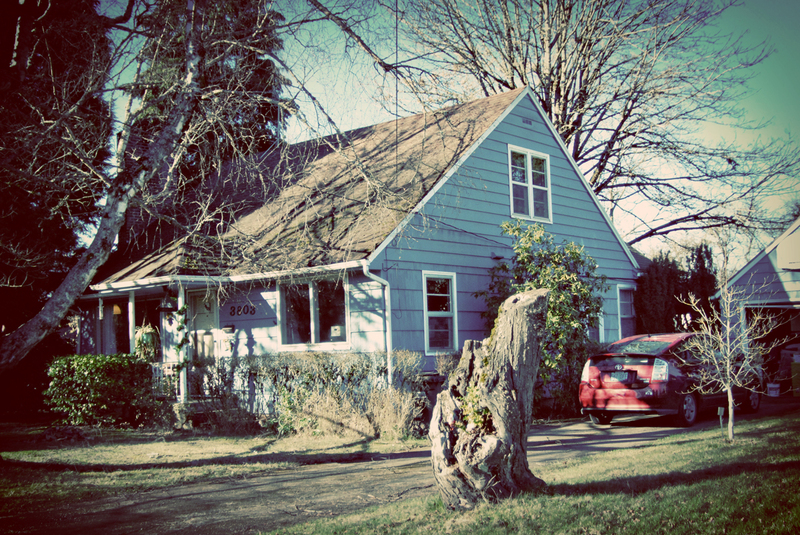 I am determined to change my ways with this house though. A big plus is that we’re going to remove the carpet in the living room right after we paint (hardwoods underneath), so big giant free drop cloth! Sucky thing is, we’re painting the ceiling too, and I’ve never painted a ceiling, but I can only imagine that it’s 10x worse than painting walls. After this I will have crazy strong arms. So, in Max’s room (formerly Sherri’s craft room, and before that it was Rob’s old room) we’re going to be painting 3 of the walls a pale light blue, and the 4th will be painted in black chalkboard paint, and the trim will be white. Also the ceiling. Ugh. In the living room we’ll be painting the the wall to the right a bold green called Envy. The remaining three walls will be white with a stripe of the green about 3/4 of the way up the wall. After we’re done painting we’ll be pulling up the carpet to utilize the beautiful hardwoods underneath. Not excited to be pulling staples and tack boards out though. Painting will begin this weekend with the help of many friends. I’ll be on hand to document, bark orders and make sure no one is having any fun. Stay tuned!